Sennheiser's range of headphones covers every base imaginable, but it seems to have been a while since we looked at any of its cheaper hi-fi models. Do these HD 485 phones offer a bargain approximation of the performance of the rather wonderful HD 650s? Appearance-wise, at least, they're not very similar to the 650s, but they're certainly smart and modern, with an ingenious nod to the famous Sennheisers of yore in the spoked ear-cup. At first sight, the cups look too small to fit over most ears, but in reality they fit snugly. This both keeps them on your head when you turn round and ensures the sound is well coupled into the listener's shell-likes. Comfort is pretty good - some may find the clamping force on the head a little too much, but sweat doesn't seem a major problem. Most importantly, what we like about these headphones is the sound. Clearly they've benefited from some 'trickle-down' technology. In a side-by-side comparison with the HD 650s, they're easily distinguishable by their relative lack of transparency and slightly sibilant character, but that's hardly surprising. After all, we're taking as a reference a product that offers fine value at five times the price. 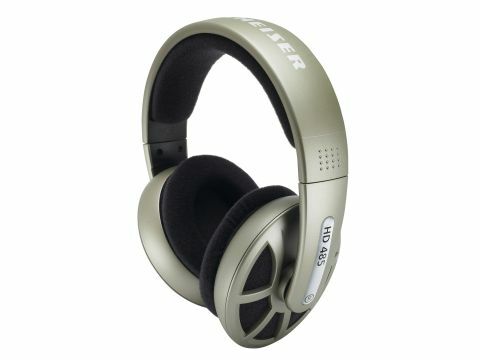 In terms of what one expects for well under a ton, the 485s are an astoundingly fine example of the headphones art. Their levels of transparency and resolution are on a par with what one expects from speakers costing a king's ransom, and the extended bass and treble are fabulous too. The sibilance will only bother the most picky.